Caney Creek Cabins provides you with convenience and privacy, allowing you to fully enjoy the majestic beauty of nature. 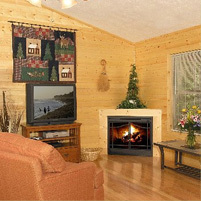 Our vacation rental cabins offer one of the best values for family vacations in the Smoky Mountains. Tucked away in a shady mountain hollow, Bill and Shirley Huskey operate their sweet little cabin rental office out of what was Bill's childhood home. Living on a road may have had it's drawbacks while raising kids ~ but it works out great for an easy-to-locate business. In the foothills around the cabin rental office you'll find your perfect vacation cabin, equipped with all the comforts of your home. Your hosts know you want Smoky Mountain views, just enough seclusion, and don't be surprised if you see a WiFi repeater duct taped to a tree ~ they know you want that, too. Bill and Shirley have worked hard to run their operation with their eye on maintaining their 80% repeat business rate. They know that all the technology in the world can't win 'em back those guests year after year. It takes consistent value, cleanliness, and mountain hospitality. Perfectly situated off the Foothills Parkway Spur between Gatlinburg and Pigeon Forge, take a short ride to shopping and attractions, if you can bear to leave your Caney Creek cabin. 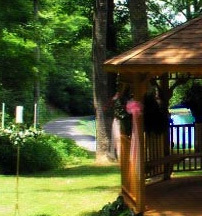 A fishing lake, a picnic pavilion, and a gazebo round out the possibilities for making the most of your vacation in the Smokies. If you do drive the beautiful Spur to Gatlinburg, you'll find a huge selection of fine restaurants, along with the local lunch counters. They say all trolleys lead to the Aquarium of the Smokies ~ located in the heart of Gatlinburg ~ so park your car and hop on a trolley for the easiest and cheapest way to tour around the sights, including the Glades Arts and Crafts area. Gatlinburg also boasts several 'motorist friendly' entrances to the Great Smoky Mountains National Park. Go in the opposite direction to find yourself only minutes from the bustle of Pigeon Forge. Plenty of eats abound if you get tired of cooking in your cabin. Take the kids for a fun afternoon of go-karts and fast food, saving room for one of the dinner shows later that evening. Pigeon Forge is home to Dixie Stampede and Dollywood, among other fun attractions and shopping malls. This all adds up to comfort and convenience at that great Caney Creek price! Select your cabin and see why Bill and Shirley's guests become their repeat friends while vacationing in the Smoky Mountains for going on twenty years! No shenanigans! Bring on the auditor! At Caney Creek Cabins, we always have, and we always will treat your money as we would want our own to be treated by keeping it safe in an escrow account until your departure. TCSReservations ~ Vacation Rental Management Software.